Opp. Dabur Chawk, Ghaziabad. India. Today�s hot topic is energy, particularly in the scenario when crude price is increasing almost everyday. Energy is definitely an essential element of today�s society. We can not even dream without energy. People simply expect it � and demand it and therefore, people of today virtually takes it for granted that it is there, you pay for and have it. Number of times every day � at the touch of a switch, turn of a key or push of a small button � energy is delivered instantly. Today�s energy is used in cultivation, creating products, product movement, generating commerce in safer, stronger, and more efficient than at any time in the history. With on going liberalization process there has been a drastic change in the Indian economy and there is a sign of positive growth of both Agricultural and Industrial production. Automobile industry growth in any country is driven from growth on the transportation. India�s transportation growth is basically driven from agricultural growth. In the year 2004, the average growth of vital truck segment has been recorded to above 12%. Average passenger car growth has been close to 10%. Scooter growth rate has been 9% and motorcycle growth rate by 7%. OTR growth rate has been close to 5% per annum. The above growth rate figure is of OEM. Some of the major OEM manufacturers in India are Maruti, Toyota, Ford, Hyundai, General Motor, Honda City, Fiat, Telco, Mercedes, Mitsubishi, Mahendra & Mahendra, Swaraj Mazda, Volvo, TVS, Bajaj Auto, Hero Honda, Suzuki Motor etc. Some of these foreign companies have taught us good practices in quality processes lke 5S, TPM, TQM etc. for industry discipline, managing product processing, defects, managing inventory and dispatching to customer for highest level of customer satisfactions, customer relations and so on. Average income of lower middle class and middle class people are increasing due to economical growth on the investment policy by Government of India. Constraints of Indian Railways to meet the growing demand for passenger and goods transport. Road transport is the major link for essential goods to the rural masses and transportation of farm produce to the cities. Development of golden quadrilateral and North-South & East-West Corridors National Highways. More and more capacity utilization in Automobile industries. Easy financing for new and old vehicle purchase. Time has changed and is changing very fast. Developed nations are looking at India with more respect now. Indian contribution in the ancient ages had been known but unfortunately these were not been well communicated to the rest of the world and many of these information were lost under the shadow of British rule in India over a period of 200 years. Many important information are coming now, were not known to the world. India is more than 5000 year old ancient civilization. India first invented the Number System. Zero was invented by Aryabhatta. The place value system, the decimal system was developed in India in 100 BC. Aryabhatta was the first to explain spherical shape, size, diameter, rotation and correct speed of Earth in 499 AD. The World�s first university was established in India in Takshila in 700 BC. Students from all over the World studies more than 60 subjects. Sanskrit is considered the mother of all higher languages. Sanskrit language is known to be the most precise, and therefore suitable language for computer software-a report in Forbes magazine, July 1987. There are 325 languages spoken in India, have 1652 dialects and having 18 official languages, which is very unique anywhere in the World within 29 states, and 5 union territories. Having population close to 1.3bn within an area of 7516 KM � coastline. There are 5600 dailies, 15000 weeklies and 20000 periodicals in 21 languages with combined circulation of 142 million. Current GDP rate close to 8%, $576bn. India is the largest English speaking Nation in the world and 2nd largest pool of Engineers and Scientist in the World. McKinsey believes India�s revenue from the IT industry will reach $87 bn by 2008. Flextronics, the $14 bn global major in Electronic manufacturing services, has announced that it will make India a global competence centre for telecom software development. Tata Motors paid $118 mn to buy Daewod commercial vehicle company of Korea. Ranbaxy, the largest Indian pharmaceutical company, gets 70% of its $1 bn revenue from overseas operations and 40% from USA. India is one of the world�s largest diamond cutting and polishing centres, its exports were worth $6bn in 1999. About 9 out of 10 diamond stones sold anywhere in the world, pass through India. Mobile phones are growing by about 1.5 mn a month. Long distance rates are down by two-thirds in five years and by 80% for data transmission. Wal-Mart sources $1 bn worth of goods from India � half its apparel. Wal-Mart expects this to increase to $10 bn in the next couple of years. India�s INSAT is among the world�s largest domestic satellite communication systems. India�s Geo-synchronous Satellite Launch Vehicle (GSLV) was indigenously manufactured with most of the components like motor cases, inter-stages, heat shield, cryogenic engine, electronic modules all manufactured by public and private Indian industry. India is providing aid to 11 countries, writing-off their debt and loaning the IMF $300M. It has also prepaid $3bn owed to the World Bank and Asian Development Bank. The Indian pharmaceutical industry at $6.5bn and growing at 8-10% annually, is the 4th largest pharmaceutical industry in the world, and is expected to be worth $12 bn by 2008. Its exports are over $2 bn. India is among the top five bulk drug makers and at home, the local industry has edged out the Multi_national companies whose share of 75% in the market is down to 35%. Trade of medicinal plants has crossed $900M already. There are 170 biotechnology companies in India, involved in the development and manufacture of genomic drugs, whose business is growing exponentially. With more than 250 universities, 1,500 research institutions and 10,428 higher-education institutes, India produces 200,000 engineering graduates and another 300,000 technically trained graduates every year. Besides, another 2 million other graduates quality out in India annually. The Indian Institute of Technology (IIT) is among the top three universities from which McKinsey & Company, the world�s biggest consulting firm, hires most. India can produce now all types of rubber products beginning from critical applications in information technology, footwear, cables, pharmacy, critical products of passenger car profiles, hose, conveyor belt, transmission belts, V-belts, gasket, oil seals to higher rated passenger car tyre and all steel truck tyres for domestic use as well as for exporting to abroad. Today large and medium sectors are not so much in threat as much as small sectors. Large and medium sectors have money power and they have options for diversification, which may not be true for small sectors and their current situation, is either survive or die. Today�s major challenge for small sectors are on cost, quality and productivity. Fig. 1. 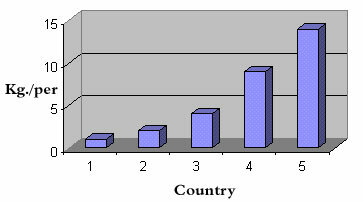 Rubber Consumption Pattern. 1-India, 2-China, 3-Europe, 4-North America, 5-Japan. What we really need now is better understanding in the business. It is not enough that we know making a product and the existing profit margin in the domestic market is also known. Our strategy needs to be changed entirely from domestic market focus to international market focus. India�s small scale industry is driven by business community. In most cases the owner becomes the technical man, marketing man, quality man, production man, commercial man etc. � which means the owner is everything. In most cases owner�s relatives will be holding all key position in the organization and as a result multifunctional communication is lost and finally loses the opportunity for the future growth of the company. We need to bring the concept of R&D center very fast in small manufacturing sectors. R&D center does not mean purchasing of costly equipments and publishing of theoretical papers in different journals. R&D center in small organization should work in harmony with production, marketing and customer. At least all manufacturing organization, however small it is, will have a quality control department for controlling incoming raw material, process and identifying the quality of product suitable for customers. R&D center can be made as a special wing from existing Quality Control department only. R&D center performs the company objectives today, tomorrow and after 5-10 years from now. Which means R&D center practically provides business directives for present and future. This is very true in all developed nations. We need to bring on these concepts as fast as possible. Indian R&D centers should take the advantages of academic based technologists and train them as per company requirements. For rubber industry alone India has 10 Degree Colleges, 2, Diploma Courses, 3 Post Doctorate Research Institutes, 4 Research Institutes, 14 Testing Laboratories and 6 Certifying Institutes. Selection of right candidate and training of them are important in any organization and the next important part is to provide atmosphere to retain those R&D executives. Most important part is an approach should be made to monitor continuous resource finding in R&D center. They should be given appropriate training and these executives, intern, can train others. Per need of the company, an aim should be there for restructuring the R&D wing as and when required. As already emphasized, R&D concept can begin from the existing quality control wing itself. For developmental jobs if required out side testing may be considered, if the cost of the equipments are not affordable. A time may come when out side testing will gradually become expensive, only at that time it might be worth while to procure the equipment for future cost reduction. All Indian R&D Center has to be interactive with Production and Marketing to give Business Directives (Fig.2). The most important part, which is also lagging in our existing R&D center that any R&D center has to be based on customer focus to integrate on raw material requirement, processing requirement and quality of product suitable for customers and finally gives business directives in the scenario of political changes and economical changes. Fig.2 : R&D Center to be interactive with Production and Making to give Business Directives. All manufacturing industry will have a quality wing for controlling in coming material, controlling process and the finished goods. Quality of product is � Attributes Accepted by Customers. Attributes could be anything, look, design, performance, durability, comparison etc. 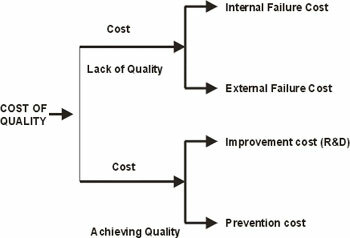 Cost of lack of quality can again be due to two primary reasons; internal failure cost and external failure cost. External failure costs are damaging since most cases this will be returned material from the customers due to customer dissatisfaction and therefore it adds transportation cost as well as the cost of losing the customers. When quality of the product is being maintained, there are two types of costs; prevention cost and cost for improvement and in the later part R&D can play the major role. There has to be some technology background through which the current product is being made. For improved quality in the competitive scenario, better technology might be required and R&D can help in Product Design and Development, Process Design and Development, Compounding Design and Development, Finding alternatives, Development of man power etc. R&D will be basically for all necessary alternatives in the competitive market and it is to be focused on cost saving on all activities in manufacturing the products. Practically R&D wing helps in cost saving in developing the right product and right man power such that the continuity of the right product is maintained. Concept of right product, changes with time because the demand pattern in the society is changing continuously. Fig. 4 : Practically R&D wing helps in cost saving in developing the right product and right man power. Manufacturing Profiles for Automobiles. Dr. S. Majumdar, Rubber Chem Review (17-23) March-April 2005. Carbon Black, Dr. Samir Majumdar, Marketing In a New Era : A Global Perspective, Proceeding of Amity Business School, Noida, at Banquet Hall, Hotel Ashoka, Chankyapuri, New Delhi, Dec. 21, 2004. Challenges, Prospects and Vision of the Indian Rubber Products Manufacturing Industry, Shir Raghupati Singhania, VC & MD � JK Industries Ltd., International Rubber Journal (24-28), June 2005. CBFS, Dr. Samir Majumdar, Rubber Chem Review, July � August (17-23) 2005.